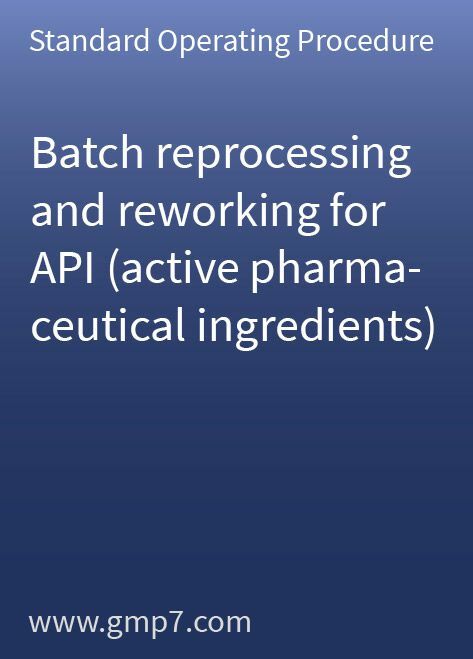 “Failure to ensure that reprocessed batches of product will conform with all established standards, specifications, and characteristics [21 CFR 211.115(a)] in that there were no written procedures and validation data that support the reprocessing and reworking of products.” This is an FDA 483 observation that could have been avoided by having an internal procedure (SOP) in place that contains clear guidance on the steps that need to be taken before performing reprocessing or reworking. This Standard Operating Procedure (SOP) is based on Q7A Section XIV, CFR211.115 (a) and (b) and the applicable guidance documents and provides clear and concise guidance for the important steps involved. It also clearly defines the responsibilities for reprocessing and/or reworking investigations, which is a crucial prerequisite for any functional system. This 10-page Standard Operating Procedure (SOP) only needs a small amount of site-specific modification before you can adopt it for your operations.